School prestige, playing time, coaches, and as of late, uniforms – all of these can be influential factors when a highly sought-after high school football star is contemplating which school to attend. For a hulking defensive tackle who craves the savory Mexican food unique only to his hometown, food can actually play quite an important role. 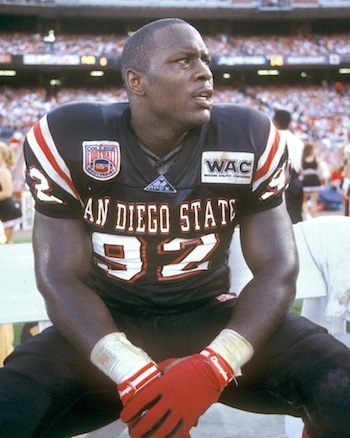 San Diego native La’Roi Glover had several scholarship offers from illustrious programs coming out of high school in 1992, but none of the schools offered what his hometown school San Diego State did. Glover played Pop Warner at an early age, but after flirting with the weight limit, he was eventually too big to play. It wasn’t until he enrolled at Point Loma High School that he was able to strap up the pads and step on the gridiron again. After a stellar career at Point Loma, schools were salivating at the mouth with hopes of Glover joining their program. Little did they know, Glover was salivating at the mouth in sunny San Diego, devouring carne asada burritos and fish tacos on a daily basis. It didn’t take long for Glover to establish himself at SDSU. He was a four-year starter on the defensive line, and his rare blend of size and athleticism created chaos for opposing offenses. Off the field, instead of focusing solely on football and school during his summers at SDSU, Glover added another responsibility to his plate. Unlike his other obligations, though, this was a tasty one. After four solid seasons at SDSU, Glover was ready for the next level. In the 1996 NFL Draft, he was selected by the Oakland Raiders in the fifth round. The Raiders released Glover after just one season, but he refused to let this event hinder his future. In 1997, Glover was picked up by the New Orleans Saints, and his career took off. He spent the next five seasons in New Orleans, and solidified himself as one of the top defensive tackles in the league. After his stint with the Saints, he played with the Dallas Cowboys from 2002-2005, and the St. Louis Rams from 2006-2008. In his 13 seasons in the NFL, Glover was a six-time Pro Bowl selection and three-time All-Pro selection. He was also named the NFC Defensive Player of the Year in 2000, when he led the NFL with 17 sacks while playing for the Saints. The honors mean a lot to Glover, but he took away more than just plaques and awards from his NFL career. The relationships Glover made with front office staff members proved to be very beneficial, as they eventually got him a new job. Following his NFL career, Glover was hired by the Rams as the director of player programs. Now in his third year, his duties include helping players with financial education, career development, continuing education, and family assistance. He also helps rookies transitioning into the league, and older veterans transitioning out. Glover continuously stresses to players the importance of education, something he exemplifies in his own life. He received his degree from SDSU after double majoring in public administration and sociology. He then received his masters in business administration from Fontbonne University in St. Louis while working with the Rams. The educational road does not end there for Glover, as he is now pursuing a doctoral degree through the University of Maryland University College. Today, Glover lives in St. Louis with his wife and three children. Although he is admittedly busy, he always finds time to help his alma mater. He has stayed close with the SDSU athletic department since his collegiate days, contributing to the alumni association and even providing voice-overs for commercials. He worked with the alumni association in 2008 when the phrase “Aztec for life” was established, and is a big supporter of the phrase. “Together we established a mantra or catchphrase, and that’s still the mantra to this day,” Glover said. “It’s something that can stand the test of time and something that people in the community can rally around. This is not something that is a one or two year deal.